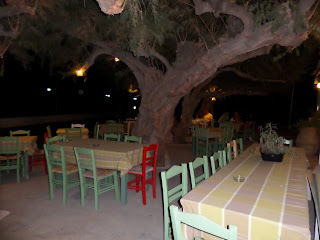 To Votsalo (The Pebble) is a lovely taverna just behind the beach at Kouremenos. The same family own Cafe Stavedo (Downwind) next door, as well as the nearby Glaros Rent Rooms (The Seagull). Cafe Stavedo was closed when we went by last night - I suppose mid-September the majority of the tourists have already packed up and left this area - but I did go there last year once or twice, with Sage, and nobody seemed to mind. 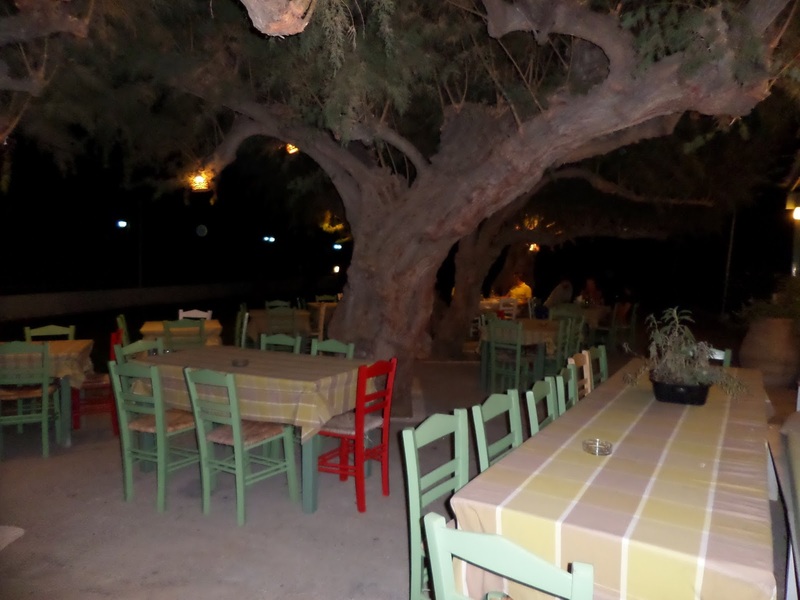 This place stays open late in the evening during the summer, and usually fills up after people have left the tavernas (or during the afternoons for coffee). 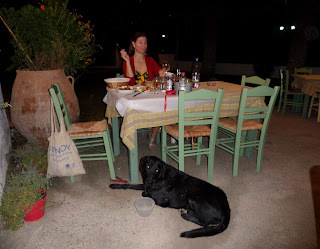 So, we went to have dinner at To Votsalo taverna. 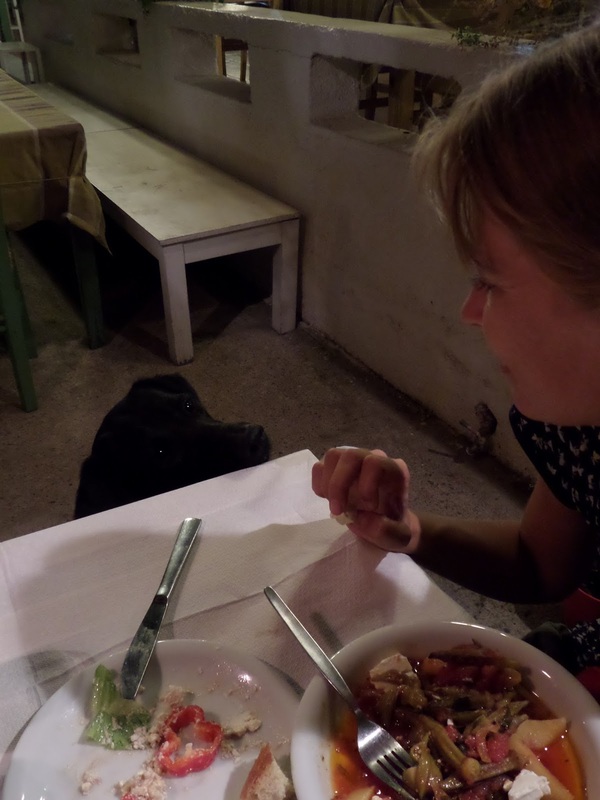 This taverna is also closing soon for the winter, so I'm glad I got there in time for a last meal down by the sea at Kouremenos. I should say that this place would probably be rated 'dog tolerant' rather than 'dog friendly'; it seemed the staff were a bit apprehensive about Sage, and although they were fine about us bringing her, they didn't seem to be exactly 'dog lovers'. The decor of To Votsalo is simply and beautifully done - with lanterns hanging from the trees, colourful chairs arranged around just the right amount of tables to seem full but not packed in, cushions on benches, flowers in pots... And to top all of this, you are less than 5 metres away from a long, sandy bay that ends with the distinctive squashed pyramid shape of Kastri mountain. The food was great. They serve all the typical grilled meats and fish, as well as some 'specials' such as okra in tomato sauce, and oven-cooked lamb. I would say the prices are higher than in the nearby villages at Palaikastro and Angathias, but not too bad (we paid 30 Euros for okra, meatballs, salad and wine). 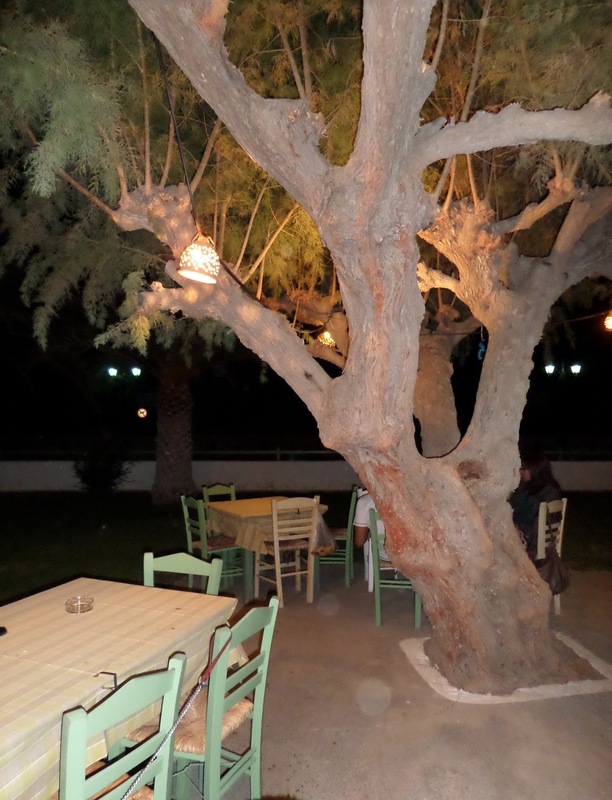 This taverna is closed in the winter, and opens around Easter. Definitely worth a visit if you find yourself hungry, in East Crete... with your dog.